VATICAN CITY (CNS) — Catholics can’t put their faith on a part-time schedule or rely on it just for the moments they choose; being Christian is a full-time occupation, Pope Francis said. If people don’t open their hearts to the Holy Spirit to let God purify and enlighten them, then “our being Christian will be superficial,” the pope said May 15 at his weekly general audience. Knowing and doing what God wants is not possible with mere human effort — it takes the transformative action of the Holy Spirit, he said. Speaking to more than 80,000 people gathered in St. Peter’s Square, Pope Francis also announced his September visit to Cagliari on the Italian island of Sardinia, where he plans to venerate the icon of Our Lady of “Bonaria” or “Buona Aria” (“good air” or “fair wind”), the namesake of his native city of Buenos Aires. The pope dedicated his audience talk to the Year of Faith and, anticipating the feast of Pentecost May 19, focused on the role of the Holy Spirit in guiding the lives of the faithful and the church to the truth. 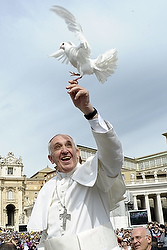 The pope also released two doves into the square in an impromptu moment. While he was riding in the open-air popemobile, a pilgrim handed the pope a cage with two white doves inside. At first, aides were unsure whether the woman really wanted them set loose, but after her reassurances, they opened the cage door and the pope reached inside to grab the first one, which he expertly tossed into the air. The second dove proved more difficult as its wings got caught in the cage’s small opening. The dove didn’t seem to want to go as it tightly clutched the pope’s fingers with its small feet before finally taking off and circling over the crowds. His deft handling of the birds perhaps shouldn’t come as a surprise. According to the pope’s sister, Maria Elena Bergoglio, the future pope had a parrot when he was in the seminary. In his audience talk, Pope Francis said the modern world is skeptical about the truth and echoed Pope Benedict XVI’s warnings about relativism, which holds that nothing is definite and that truth is based on consensus or personal whims. But Jesus is the truth that “came among us so that we could know it,” he said. “The truth isn’t seized like a thing, the truth is met. It’s not a possession, it’s an encounter with a person” in Christ, he said. The Holy Spirit was the Risen Christ’s gift to humanity so that they could know and recognize that Jesus is the Word of truth, he said. Through the Holy Spirit, God’s word and law are “inscribed in our heart and become the principle in us for evaluating our choices and guide for our daily actions, becoming a principle of life,” he said. If people open themselves up to the Holy Spirit, he is the one who transforms that heart and makes it new, “giving us the intelligence of the things of God,” he said. He asked people to take concrete steps to know Christ better, especially during the Year of Faith, by reading sacred Scripture, studying the catechism and taking part in the Sacraments. “I can’t hear you,” the pope said, smiling and patting his ear, drawing even louder shouts of affirmation from the crowd. During his greetings to different language groups, the pope thanked Polish pilgrims for taking part in a city-wide March for Life in Szczecin, Poland. He said such an initiative “reminds everyone of the need to promote and defend human life from conception” to its natural end. He also greeted students, particularly those from Catholic schools.